As winter continues to dump record amounts of snow, sports enthusiasts are salivating at the thought of fresh powder for skiing and snowboarding. And since ski resorts are incredibly vulnerable to climate change, it makes sense that companies are offering up green sports equipment. The Arbor Collective was at the vanguard of sustainable winter sports in 2001 with its bamboo snowboard. Now the company is going one step further by adding fast-growing bamboo to its snowboard sidewalls, which are normally made out of fiberglass or polyethylene. Arbor’s bamboo snowboards aren’t just sustainable–they’re also practical. In addition to cutting down on fiberglass and resin use by up to 20%, the bamboo supposedly makes the boards more responsive for riders who want to attempt long jumps. Bamboo is also used in Arbor’s “lifestyle” apparel, cutting down on the chemical additives, fertilizer, and irrigation necessary to make cotton. Now that Arbor has proven the viability of making quality bamboo snowboards, other companies have followed its lead. 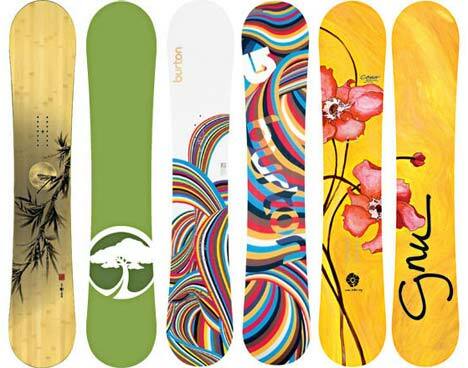 Arbor competitor GNU Snowboards, for example, also uses bamboo in some of its products. And Indigo offers a slick bamboo snowboard with a reinforced carbon fiber core. Not to worry, skiers–there are plenty of bamboo options for you too. Blue House, Kingswood, Liberty, Lokomotiv, and Boomtown are just some of the companies that fashion skis out of bamboo.